Nicole Young is currently a Recruitment Marketing Lead within the Global Workforce Staffing (WFS) Associate Attraction team for Amazon. This team generates demand for the Amazon hourly brand, and converts that interest into hiring new employees. In this role, she is responsible for creating successful marketing strategies that generate applications in efforts of hiring thousands of hourly Operations team members in order to deliver on Amazon’s high bar for customer obsession. 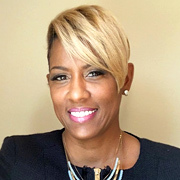 Prior to joining Amazon, Nicole has had a very diverse career within Human Resources holding various positions including Inclusion and Diversity Regional Lead, Recruiting Manager, Employee Relations and Retention Consultant, Staffing and Sourcing Solutions Manager, Strategic Workforce Planning Specialist, Corporate Developmental Trainer. She started her career by receiving her bachelor’s degree in psychology with a minor in English from the University of Houston, and furthering her education by pursuing a Master’s Degree at Penn State University in Human Resources and Employee Relations. Nicole has experience in several industries including banking and finance, oil and gas and e-commerce. She cites that all her previous roles presented particular challenges that in turn provided her with valuable lessons that fueled her career. Today, Nicole resides in Katy, TX with her husband, four sons and their dog “Maximo”. Besides spending time with her family, she enjoys sharing motivational messages of Leadership and Inclusion learned throughout her 20 years of experience.